Hi, I’m Brittany, and I don’t like onions…unless they’re fried onions, or in this case air-fried onions! Yep, that’s right: Your favorite holiday topping can now be made (pretty) healthy with the help of our new favorite kitchen gadget. Air-fried onions. Yea, you’re gonna like this one. Do you have an air fryer yet?!?! We got ours as a gift from a good friend and have been looooving it! Air fried tofu, taquitos, french fries, croutons, ravioli! We’ve even put air-fried doughnuts to the test. Basically, whatever you would like to eat deep-fried can just as easily be made in the air-fryer with all the deliciousness but muuuuch less oil…or no oil at all, whatever your fancy! And now, we’re adding air-fried onions to that list. 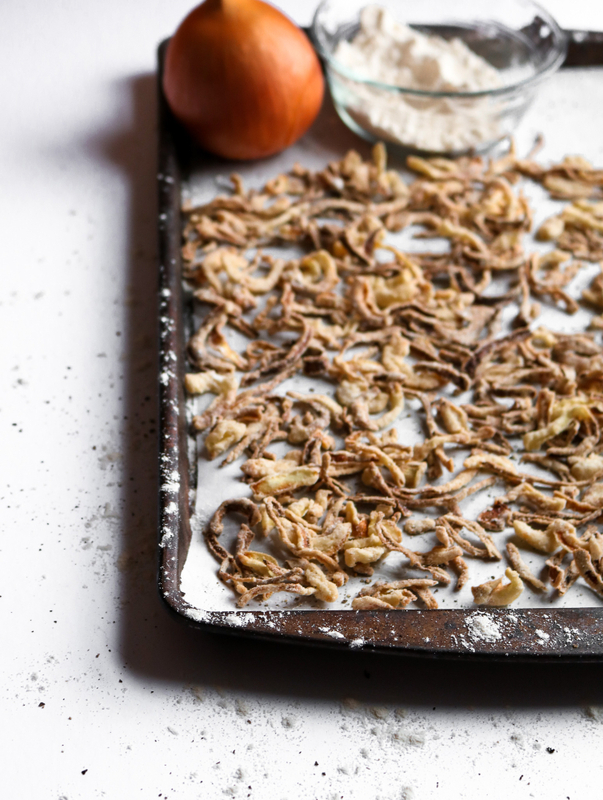 For those of you who don’t know, french fried onions are those crispy little curls of deliciousness that typically top green bean casseroles and the like on your holiday table. Now you know what I’m talking about, don’t you? They’re the best. But unfortunately, like most deep-fried things, they are addictive yet pretty heavy on the tummy. They are for me at least. So, when T made a quick version in the air fryer a few months ago with all the taste but none of that heavy bloated feeling, I knew we had to perfect this for the blog! 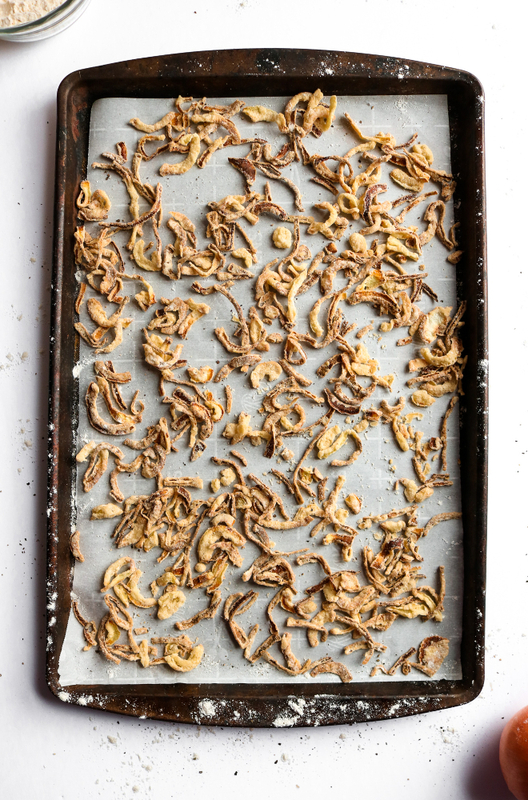 And the recipe we’re sharing with you guys today is pretty killer: easy to make, delicious, and rather healthy compared to their oil-laden counterparts. Win-win-win!! You can take these air-fried onions beyond green bean casseroles, of course. We’ve used them to top salads, chili, soups, and even warm dips! Let your creativity run wild; everything tastes better with these crispy swirls of yumminess on top! 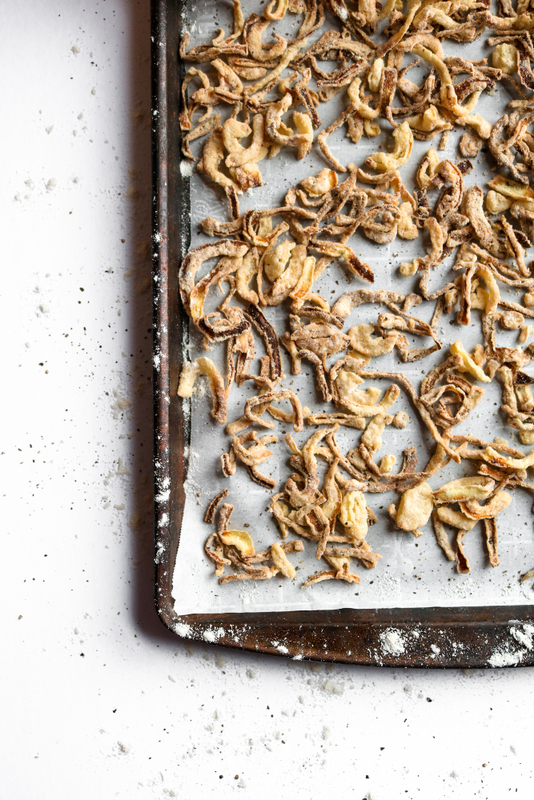 If you make these air-fried onions, let us know how it goes and what you do with them! We’re super pumped to hear your ideas! Tag us in your beautiful photos on Instagram (we’re @theplantpowercouple, with the ‘the’). These french fried onions are made in the air fryer and perfect for all your holiday meals or to top salads and soups any old day! Add the onions to a shallow dish or bowl and pour the soy milk over them until they are just covered. Let soak for at least 10 minutes. While the onions soak, grab a mixing bowl. To it, add the flour, sea salt, and black pepper. Whisk until combined. Remove the onions from the almond milk. You can save this to add to soups or other savory dishes later. Toss your onions with the flour mixture, one small batch at a time to get a nice coating. Lightly spray the air-fryer basket and the flour-coated onions with oil. Add the onions to the basket and place in the air fryer. Cook the onions at 350F for 30-35 minutes, stopping to shake the basket every 10 minutes. Depending on the size of your onion and air fryer, you may want to do this in two batches. Remove the onions from the air fryer and let cool before eating. Use them to top all your holiday dishes like mashed potatoes, green bean casserole, and basically your entire life! Can I use an oven if I don't have an air fryer? Hi, Carly! We haven't tested this recipe in an oven, but I'm sure if you adjusted the time / temperature a bit, it would work! I'd think you'd also want to flip them halfway through. I made these according to the directions but it took less than half the time and they taste a little burnt. They are super crispy though. Hi, Anna! Sorry to hear they're tasting burnt. To amend it, I'd lower the cooking time and maybe stop to shake the basket more often, so you can keep an eye on them! Could I use a gluten-free flour instead of all-purpose flour?